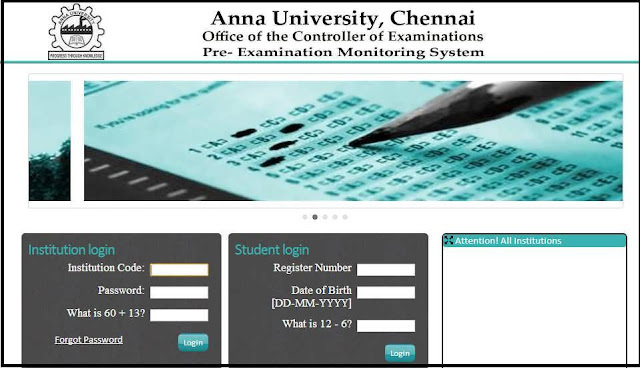 Students Check Your Coe1.annauniv.edu Anna University Chennai Controller of Examinations Students login Portal for the internal marks & Assessment exam reports 2019 for affiliated college students, Anna university students login coe1.annauniv.edu.home, coe2.annauniv.edu. 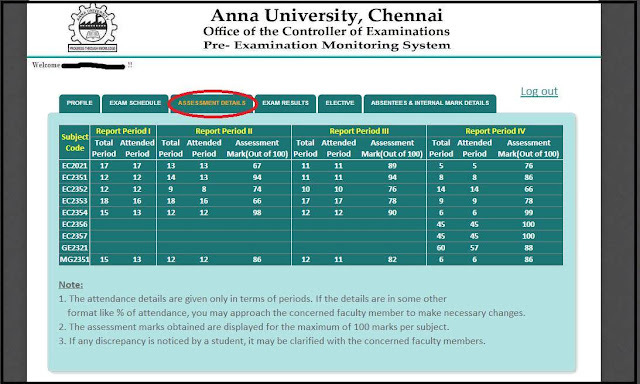 Hi students, in this guide, I am going to tell How to Check the Anna university Internal Marks 2019 in Students portal COE1.ANNAUNIV.EDU official website of www.annauniv.edu for the students to check internal marks, results, exam timetable, and chosen electives. Some Years before the internal marks will be updated at the end of all internal assessments only, Anna university affiliated colleges students will know their internal marks some days before the Semester examination only. Still, the students will not know about the internal marks uploaded. Now Anna University created a Dedicated Site called "Anna University Student Login Portal" to check their elective, internal marks, results, exam timetable and chosen electives by them. Also coe2.annauniv.edu.home specially dedicated for Results to reduce Load on coe1.annauniv.edu home Sever. You can check the internal marks from coe1 portal after each internal assessments- period wise, final internal marks for 20 marks. Your parents can also able to check their son or daughter’s internal marks, exam results using this Anna university students login portal. Internal exams are conducted from your college side and the answer sheets were vaulted within your department staffs itself. The marks which you scored in the internal assessment were updated on the coe.1 student’s web portal. coe anna university calculates your final internal marks based on the 3 internal assessments marks uploaded by your college, so it’s compulsory to attend the internal assessments. How coe1.annauniv.edu.home internal marks for Examination Will Be calculated? Theory semester exam will be conducted for 100marks and it will be converted to 80 marks and added with the anna university internals 20. (80+20=100). AnnaUniversity Internal Marks for April/May 2019 EVEN Semester updates, Check anna university web portal Internal Mark for both UG & PG - coe1.annauniv.edu for all april, may, june UG PG 2nd 4th 6th 8th Students Check @ coe1.annauniv.edu home login. Soon the www.annauniv.edu internal marks for other Reports will be Updated. Students can check their Coe1.annauniv.edu Anna University B.E / B.Tech Internal Marks, Attendance, Assessment Details 2019 on coe1.annauniv.edu home student login Site. You can get the complete details about your internal marks from this portal, continue reading this post for the guide to check anna university attendance percentage online..
Click here to visit anna university website for Students. Enter your Register Number, D.O.B and fill the verification field to login into your profile. Now navigate to the "Assessment Tab" to check your internal marks, it will look like as shown in the below figure. After seeing the marks, click on Logout to close your session. Click here to visit www.annauniversity.com Students portal site. Now navigate to the "ABSENTEES & INTERNAL MARK DETAILS" Tab to check your internal marks, it will look like as shown in the below figure.